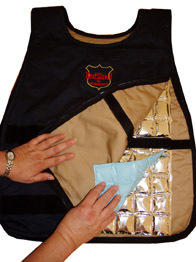 Purchase a set of four inserts for your cooling safety vest. For durability and economic purposes, our inserts are shipped DryPack and should be hydrated before use. 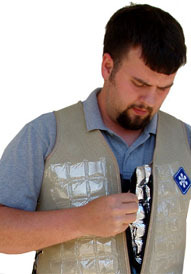 Cooling vests are designed to be used with multiple layers of inserts, so keep cool with an extra set at all times. Our cooling vest and leggings come with four inserts and can accommodate up to 8 using a double layer. The inserts for our body cooling products can be charged over and over in a freezer and will layer into the vest when you need to extend your cooling time. We recommend these inserts for the CM2000 and HeatShield II cooling vests and leggings. An extra set of four inserts will cost $35.00. Save on shipping and protect your vest with our DryPack shipping. Our team can also hydrate your vest for you if you would prefer. Hydration is fast and easy. Click here to learn more.